Food Costs > How Much Do Tomatoes Cost? How Much Do Tomatoes Cost? Tomatoes are among the most consumed food items in the country. While many people prefer growing them in their own backyard, there are many who choose to buy them at the local grocery store or farmers market. Tomatoes are available in countless varieties, from the freshly-picked to the refrigerated types to canned tomatoes. Tomatoes are available in countless varieties, from the freshly-picked to the refrigerated types to canned tomatoes. On average, the price of tomatoes will usually be around $1 to $7 per pound at your local grocery store. The cost will depend on the type of tomato, where you’re purchasing it from and the time of year. A bushel of tomatoes, which weigh around 50 pounds, can cost close to $25 to $35. According to a USDA report published in 2013, grape/cherry tomatoes, on average, retailed for $3.29 per pound, whereas Roma tomatoes averaged about $1.24 per pound. On this forum thread at ChowHound.com, members talked about what they had paid for tomatoes at their local farmers market. Glancing at the responses, members had paid anywhere from $5.50 per pound in Maryland to $2.50 per pound for an heirloom. Refer to our table below to see what most varieties will cost at your local grocery store. Prices for fresh tomatoes are usually low when growing conditions are good and when there is an increasing share of fresh tomato production originating from protected agriculture sectors such as greenhouses. Warm weather can also bring about a rise in supplies of high-quality fresh tomatoes, reducing the prices of the tomatoes even further. Likewise, an increasing diversity of tomato varieties, changes in market preferences and economic recession are also factors that pull tomato prices down. Tomatoes are usually seasonal products, particularly those grown on fields. Tomato production is typically high during the hot season, resulting in higher prices. However, with protected agriculture, tomato production (usually called hothouse tomatoes) is typically prolonged to a certain extent and yields are generally much higher compared with open field production, thereby bringing prices down to a specific level. While tomatoes are seasonal plants, protected agriculture (shade houses and greenhouses) has resulted in low tomato prices as suppliers are able to provide tomatoes regardless of the time of year. In contrast, tomatoes supplied by local farmers and growers are not available all year long as they have the open-field type of production. Commercially-grown tomatoes are often less expensive in comparison with those that are locally cultivated. Commercial tomatoes are produced in mass quantities while homegrown ones are usually limited, accounting for the difference in prices. The shipping-point price is regarded as having a direct link with the retail price of field-grown tomatoes. Changes in the shipping-point price have changed retail prices for tomatoes in certain periods. Labor costs, containers, fuel, transportation, power, rent and advertising expenses are usually taken into account in the retail tomato pricing. 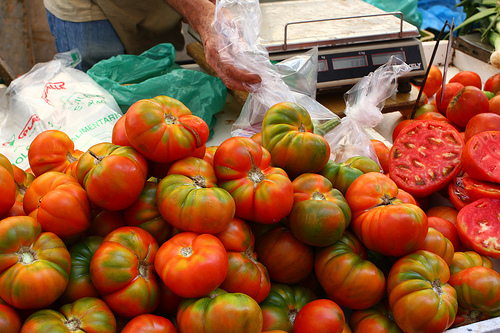 Fresh tomatoes can be bought per piece, pound, bag or box, depending on your choice and how many tomatoes you need. You can also buy canned tomatoes, which can be whole, diced, crushed or stewed. These are great for different recipes such as spaghetti. Common types found at a local grocery store or farmers market include cherry, grape, green, heirloom, plum and those that are still on the vine. Most supermarkets sell commercially-grown tomatoes, which are oftentimes of lesser quality compared with those from local growers. Local tomato suppliers usually provide tomatoes that are of superior quality since the vegetables are grown organically and there are fewer pesticides and chemicals. They are normally picked ripe from the vines, indicating that the produce has developed its full ripeness. This then accounts for their exceptional taste and appearance. Some local farmers markets may sell tomatoes at higher prices compared with those in supermarkets and groceries, but their quality is far superior. These tomatoes are also healthier, so the extra cost is worth it. When buying tomatoes, choose those that are heavy for their size. Avoid those with leaking juice and have soft spots. Avoid refrigerating the tomatoes as it will cause the vegetables to break down faster, which will negatively affect their texture and flavor. A pound of tomatoes will equal about two large sized tomatoes or three medium-sized ones. In a pint, you should expect 25 to 30 cherry-sized tomatoes. Buy in volume, particularly if you plan on preserving the tomatoes. Local farmer stands often provide substantial discounts to buyers who buy in bulk. The same can be said about those who purchase at Costco or Sam’s Club. If buying online, find a supplier that offers free shipping to avoid having to pay for avoidable shipping costs. Sign up for memberships at organizations that have Community Supported Agriculture programs. They usually yield healthier produce that is sold and delivered at a reasonable cost. Grow your own tomatoes, especially if your household has large tomato consumption. These plants are among the easiest to grow and require no complicated techniques to cultivate. Depending on the quantity planted, the production is often enough to have a sufficient number of tomatoes stored and then some preserved through canning.